I’m still studying the gardens of the Dutch Golden Age – 17th century, when painting was strong here (Rembrandt, Vermeer, Hals, Steen, Ruisdael). So how about gardening? We’re portrayed as having embraced the italian/french formal gardens, then we were apparently swept by the English wave of ‘landscaped’ gardens. My question is: how did these styles translate to the Netherlands – a country that is partly natural, partly man-made, and very flat overall. In ’12 tuinen’ i.e. ’12 gardens’ a book about contemporary gardens in the Netherlands, Paul Achterberg summarises the elements that our 17th century forebearers had to work with. He writes about estates begun on recently poldered lands, like the Beemster polder in the image below. “A country estate in this polder has a different genesis from the estates developing in established areas, for it has to be realised as if from scratch. The grid, the drainage, the horizon and the cloudy skies are its points of departure “(12 tuinen, page 307). If I take into acount the elements that Achterberg mentions, a garden celebrating clouded skies might be in order. A grid garden, something mathematical, or a garden that celebrates the distribution of light in a country criss-crossed with rivers, canals, lakes and other mirroring surfaces. So, what gardens do I know that point the eye towards the clouds? Towards the shimmering light above a body of water? Gardens that point at clouds – none come to mind. Then again, we do have Turrel’s earthworks – I’ve yet to visit his ‘celestial vault’ in The Hague. Turrell about the quality of the Dutch light: ““In the Netherlands the sky seems close by. It is an intimate sky. The crater is meant to get it closer still to the viewer. In the Sahara, in Marocco, South-Africa or Arizona one has huge plains with imposing skies above, very monumental. One can see much further than for instance across the ocean. Above the ocean the air is humid, which makes the air closer. Only when Arizona has dry snow – a few days every year – the sky is as grey and intimalte as in the Netherlands. Those were the only days I could do try-outs for the Kijkduin installation.” (Trouw, september 1996, my translation). 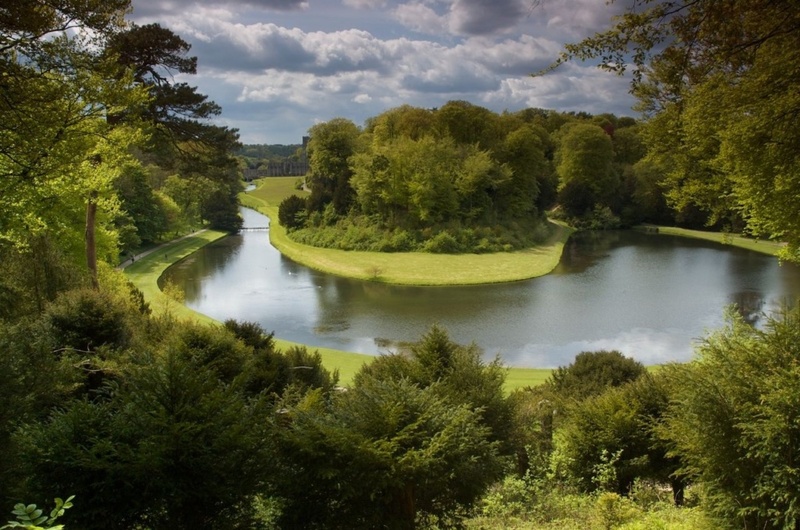 I’m also thinking about the Studley Royal Water Garden – a fascinating garden in a Yorkshire valley, consisting of grass and mirroring water only, in a setting of a wooded valley. Am hoping to visit this one again, a visit to Yorkshire being in my immediate future. And the ‘Little Sparta’ garden made by Ian Hamilton Findlay – I’ve only ever seen pictures, but his garden seems to communicate with the sky somehow.